Football is the biggest sport in Turkey. The Turkish national team played their first match on October 26, 1923. This match against Romania ended in a 2-2 draw. 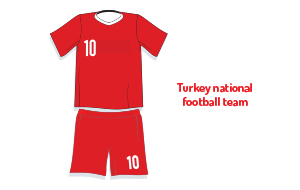 Turkey qualified for the World Cup in 1954 and 2002. The third place in the 2002 World Cup marks a high point in Turkish football history. Book your Turkey football tickets online and support the Turkish players in their attempt to qualify for the Euro 2020 played all over Europe. Euro 2016 was the first European tournament for Turkey. The teams and especially the Turkey fans made a huge impression on Europe. Are you looking for Turkey football tickets? Don’t look any further. We have a wide range of football tickets for every country. Browse through our ticket inventory and buy the best Turkey football tickets securely online. Book your tickets for Turkey in our booking system.